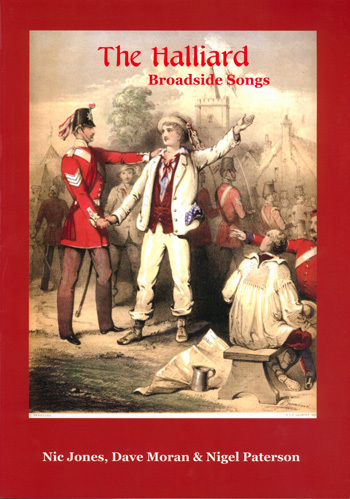 Limited first edition release of 500 in 2005 as a Special Edition Companion Set The Halliard: Broadside Songs – a songbook with insert CD. Second edition release 2006 (songbook only). The Halliard was extremely popular around the clubs at the end of the 60’s. They were original and creative, composing and singing some of the great songs of the Folk Revival of the late 1960’s. From the group’s collection of their scribbled manuscripts and old copies of broadside sheets, Dave Moran has brought together 30 broadsides set to original tunes composed by himself and Nic Jones, together with one of Nigel Paterson’s original tunes and an instrumental variation by Paterson/Jones. There are words, music, chords, articles, a history, song notes and much more. Here you will find the true origins of the tunes to songs like Boys of Bedlam, Lancashire Lads, Calico Printer’s Clerk, Ladies Go A’ Thieving (often referred to as Ladies Don’t Go A’ Thieving) and Workhouse Boy, which have long been sung around the folk scene, plus many others.